Wednesday, June 30th, 1999, a group of six of cyclists rode the Waganupa. 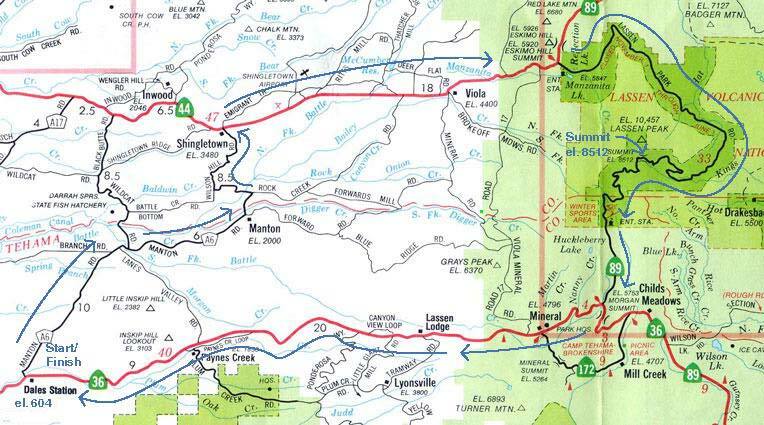 The route starts at Dales Station (elevation 604 ft.) in the far northern reaches of the central valley of California, loops up to and over the pass of Mount Lassen (elevation 8,512 ft.) and then descends back to Dales Station. Map. The ride and the name for it comes from an old book of California cycling routes that my brother Patrick has. The following link's contain BikeCam photos of the event, except for the first two pages, which were taken with the digital camera. Unfortunately, there were light leaks on many photosI used Kodak throw away cameras. Ill stick with Fuji in the future.